Our Abpromise guarantee covers the use of ab55965 in the following tested applications. WB Use a concentration of 2.5 µg/ml. Predicted molecular weight: 48 kDa. Good results were obtained when blocked with 5% non-fat dry milk in 0.05% PBS-T.
Porphyrin metabolism; protoheme biosynthesis; protoheme from protoporphyrin-IX: step 1/1. Erythropoietic protoporphyria (EPP) [MIM:177000]: A form of porphyria. Porphyrias are inherited defects in the biosynthesis of heme, resulting in the accumulation and increased excretion of porphyrins or porphyrin precursors. They are classified as erythropoietic or hepatic, depending on whether the enzyme deficiency occurs in red blood cells or in the liver. Erythropoietic protoporphyria is marked by excessive protoporphyrin in erythrocytes, plasma, liver and feces, and by widely varying photosensitive skin changes ranging from a burning or pruritic sensation to erythema, edema and wheals. Note=The disease is caused by mutations affecting the gene represented in this entry. Belongs to the ferrochelatase family. 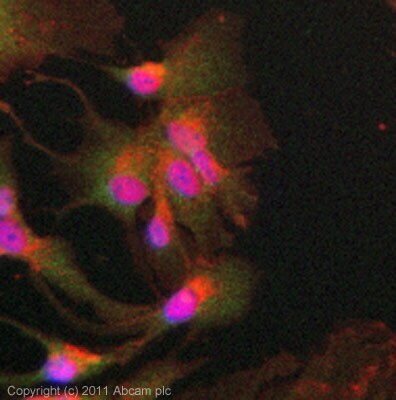 ICC/IF image of ab55965 stained HepG2 cells. The cells were 4% PFA fixed (10mins) and then incubated in 1%BSA / 10% normal goat serum / 0.3M glycine in 0.1% PBS-Tween for 1h to permeabilise the cells and block non-specific protein-protein interactions. The cells were then incubated with the antibody (ab55965, 5µg/ml) overnight at +4°C. The secondary antibody (green) was ab96899 Dylight 488 goat anti-rabbit IgG (H+L) used at a 1/250 dilution for 1h. Alexa Fluor® 594 WGA was used to label plasma membranes (red) at a 1/200 dilution for 1h. DAPI was used to stain the cell nuclei (blue) at a concentration of 1.43µM. Publishing research using ab55965? Please let us know so that we can cite the reference in this datasheet. There are currently no Customer reviews or Questions for ab55965.